Anne Boleyn – Ex-pupil of Hogwarts? I apologise for the silly nature of this post, but I just happened to be watching “Harry Potter and the Philosopher’s Stone” (“Harry Potter and the Sorcerer’s Stone in the US) yesterday with my children and I thought I’d look out for Anne Boleyn’s portrait at Hogwarts. I’d read Harry Potter trivia about Anne Boleyn’s portrait being on the wall at Hogwarts, but had always forgotten to look. My children spotted it (yes, I have indoctrinated them so that they know exactly what Anne Boleyn looks like!) 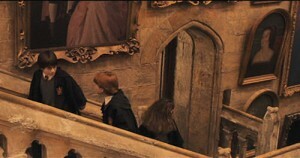 and I’ve managed to get this screen capture so that you can all see Anne Boleyn’s cameo appearance in Harry Potter. If you follow Hermione’s gaze to the right, you will see Anne Boleyn’s famous portrait in full view. So, was Anne Boleyn an ex-pupil at Hogwarts? Well, we’re obviously meant to assume that Anne Boleyn was either an ex-pupil or a famous witch, and popular opinion once believed that Anne was a witch. Anne was said to have a wen ( a type of cyst or growth) on her neck, three breasts and a sixth finger on one hand – all possible signs of her being a witch. 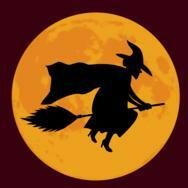 She just needed the green skin, broomstick, black pointy hat and black cat, didn’t she?! Anne Boleyn went to the Hapsburg court as a girl, then the French Court and finally the English court – If she had been deformed, her family would have kept her hidden for fear of her being burned as a witch. Henry pursued her for 7 years and was married to her for 3 years – There is no way on earth that Henry would have pursued Anne for this long if she had been unattractive or had any deformities. She could not possibly have hid her wen with a necklace and her finger with long sleeves all of the time! This monarch had the pick of any woman in Europe and certainly would not have pursued a possible witch. Anne Boleyn was religious – Historical evidence shows us that Anne was a true believer in the Reformation. Her father brought home Reformist literature from his diplomatic trips and Anne read them and even shared them with Henry VIII. She also encouraged her ladies to read the newly translated Bible. Witchcraft just does not fit in with her religious beliefs. Anne was intelligent – Anne was educated and intelligent. She would not have risked her life or marriage by dabbling in witchcraft. While we’re on the subject of Anne Boleyn’s portrait, I have just partnered with a top class art company to offer you your very own hand-painted, oil-on-canvas reproduction Tudor portraits. Why make do with a poster or print, when you can have your very own oil painting? Click here to go to our Products Page to check out the portraits. Please contact us if we don’t have your favourite portrait listed and we’ll see what we can do for you. However, once this liaison with the world of the unseen became a means towards manipulation, of altering the destiny of other persons for malevolent purposes, it was considered evil. That was the realm of the witch, or the dreaded ‘black arts’ – and the boundary between the two could often be blurred. Add an unpleasant man like Cromwell to the equation, and it is easy to see how such accusations could stick and even to be acceptable even to people of intelligence. Our modern,’ Harry Potter’ version of magic is of course entirely divorced from this older concept of the naturall universe. It is little wonder, therefore, that the myth of Anne being a witch persists and has been reduced to a kind of Disney-like theme-park kind of nonsense. You must understand. They’re making history accessible for children and how better for a teacher to get their class interested than by bringing out a copy of the philosophers stone and saying, Anne Boleyn might have been a witch. I can understand it being used as an “opener” to the topic, but then teachers need to dispel the myths and teach the truth. As an ex teacher (for my sins!) I’m not against using what’s popular and trendy to grab a child’s attention and make something more interesting, more accessible or more relevant, but falsehoods have got to be stamped out. I love Harry Potter – fantastic books and films, and J K Rowling really knows how to grab children’s imaginatons and attention. They also have the unicorn tapestries hanging in the Gryffondor common room LOL! I think an art thief lurks in that school! The Unicorn is Scotland’s “national animal”. Ooh, I’ll have to look out for the tapestries. It is funny what you start noticing when you’ve watched the films a few times! If you happen to be in Toronto or anywhere else the Harry Potter exhibit lands, check it out! The end of the exhibit displays the portrait of Anne wearing an “H” necklace for Hogwarts instead of the “B”. This always excited me so much as a child to have discovered this in Harry Potter. Im glad someone else noticed too! It really just made e laugh reading this and I just drank OJ and it came out my nose I laughed so hard! Word to the wise, don’t read this kind of humor while drinking OJ! This is appalling. I seen many different historical portraits in most of the Harry Potter movies, just because I pay attention to weird stuff like that, but I can’t believe they would put her in the background. She was not a witch, King Henry the VIII would have noticed such details. They were intimate so he would see any deformates and everyone knows he was afraid of illness. Witches can cast illnesses so he had a negative view of them. Oi, I am quite glad that most kids won’t notice that painting because they will have such a negative view of her. Hogwarts also has a portrait of Anne boleyn’s stepdaughter, Mary Tudor – holding a wand ! Claire-In a SNL skit in which Daniel Radcliffe goes back to Hogwarts, there is a portrait on Anne of Cleves on the wall! I can’t send you the link though because NBC won’t play outside of the US, usually.